Experimental demonstration of the butterfly effect with different recordings of the same double pendulum. In each recording, the pendulum starts with almost the same initial condition. Over time the differences in the dynamics grow from almost unnoticeable to drastic ones. 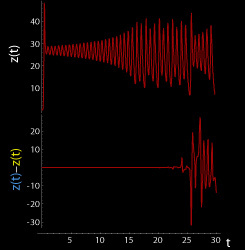 The term, closely associated with the work of Edward Lorenz, is derived from the metaphorical example of the details of a tornado (the exact time of formation, the exact path taken) being influenced by minor perturbations such as the flapping of the wings of a distant butterfly several weeks earlier. Lorenz discovered the effect when he observed that runs of his weather model with initial condition data that was rounded in a seemingly inconsequential manner would fail to reproduce the results of runs with the unrounded initial condition data. A very small change in initial conditions had created a significantly different outcome. The idea that small causes may have large effects in general and in weather specifically was earlier recognized by French mathematician and engineer Henri Poincaré and American mathematician and philosopher Norbert Wiener. Edward Lorenz's work placed the concept of instability of the earth's atmosphere onto a quantitative base and linked the concept of instability to the properties of large classes of dynamic systems which are undergoing nonlinear dynamics and deterministic chaos. In The Vocation of Man (1800), Johann Gottlieb Fichte says "you could not remove a single grain of sand from its place without thereby ... changing something throughout all parts of the immeasurable whole". In 1898, Jacques Hadamard noted general divergence of trajectories in spaces of negative curvature. Pierre Duhem discussed the possible general significance of this in 1908. The idea that one butterfly could eventually have a far-reaching ripple effect on subsequent historic events made its earliest known appearance in "A Sound of Thunder", a 1952 short story by Ray Bradbury about time travel. 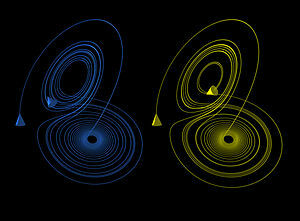 While the "butterfly effect" is often explained as being synonymous with sensitive dependence on initial conditions of the kind described by Lorenz in his 1963 paper (and previously observed by Poincaré), the butterfly metaphor was originally applied to work he published in 1969which took the idea a step further. Lorenz proposed a mathematical model for how tiny motions in the atmosphere scale up to effect larger systems. He found that the systems in that model could only be predicted up to a specific point in the future, and beyond that, reducing the error in the initial conditions would not increase the predictability (as long as the error is not zero). This demonstrated that a deterministic system could be "observationally indistinguishable" from a non-deterministic one in terms of predictability. Recent re-examinations of this paper suggest that it offered a significant challenge to the idea that our universe is deterministic, comparable to the challenges offered by quantum physics. folded within the range [0, 1]. The journalist Peter Dizikes, writing in The Boston Globe in 2008, notes that popular culture likes the idea of the butterfly effect, but gets it wrong. Whereas Lorenz suggested correctly with his butterfly metaphor that predictability "is inherently limited", popular culture supposes that each event can be explained by finding the small reasons that caused it. Dizikes explains: "It speaks to our larger expectation that the world should be comprehensible – that everything happens for a reason, and that we can pinpoint all those reasons, however small they may be. But nature itself defies this expectation." A video game Until Dawn from 2015 is based on a theory of butterfly effect. ^ a b Boeing, G. (2016). "Visual Analysis of Nonlinear Dynamical Systems: Chaos, Fractals, Self-Similarity and the Limits of Prediction". Systems. 4 (4): 37. arXiv:1608.04416. doi:10.3390/systems4040037. Archived from the original on 2016-12-03. Retrieved 2016-12-02. ^ Lorenz, Edward N. (March 1963). "Deterministic Nonperiodic Flow". Journal of the Atmospheric Sciences. 20 (2): 130–141. Bibcode:1963JAtS...20..130L. doi:10.1175/1520-0469(1963)020<0130:dnf>2.0.co;2. ^ "Butterfly effect - Scholarpedia". www.scholarpedia.org. Archived from the original on 2016-01-02. Retrieved 2016-01-02. ^ Steves, Bonnie; Maciejewski, AJ (September 2001). The Restless Universe Applications of Gravitational N-Body Dynamics to Planetary Stellar and Galactic Systems. USA: CRC Press. ISBN 0750308222. Retrieved January 6, 2014. ^ Flam, Faye (2012-06-15). "The Physics of Ray Bradbury's "A Sound of Thunder"". The Philadelphia Inquirer. Archived from the original on 2015-09-24. Retrieved 2015-09-02. ^ Gleick, James (1987). Chaos: Making a New Science. Viking. p. 16. ISBN 0-8133-4085-3. ^ "Chaos at fifty". Archived from the original on 2016-05-18. ^ Lorenz, Edward N. (March 1963). "Deterministic Nonperiodic Flow". Journal of the Atmospheric Sciences. 20 (2): 130–141. Bibcode:1963JAtS...20..130L. doi:10.1175/1520-0469(1963)020<0130:DNF>2.0.CO;2. ISSN 1520-0469. Retrieved 3 June 2010. ^ "Part19". Cs.ualberta.ca. 1960-11-22. Archived from the original on 2009-07-17. Retrieved 2014-06-08. ^ a b Lorenz, Edward N. (1963). "The Predictability of Hydrodynamic Flow" (PDF). Transactions of the New York Academy of Sciences. 25 (4): 409–432. Archived (PDF) from the original on 10 October 2014. Retrieved 1 September 2014. ^ "The Butterfly Effects: Variations on a Meme". AP42 ...and everything. Archived from the original on 11 November 2011. Retrieved 3 August 2011. ^ Woods, Austin (2005). Medium-range weather prediction: The European approach; The story of the European Centre for Medium-Range Weather Forecasts. New York: Springer. p. 118. ISBN 978-0387269283. ^ Orrell, David; Smith, Leonard; Barkmeijer, Jan; Palmer, Tim (2001). "Model error in weather forecasting". Nonlinear Processes in Geophysics. 9: 357–371. ^ Orrell, David (2002). "Role of the metric in forecast error growth: How chaotic is the weather?". Tellus. 54A: 350–362. Bibcode:2002TellA..54..350O. doi:10.3402/tellusa.v54i4.12159. ^ Orrell, David (2012). Truth or Beauty: Science and the Quest for Order. New Haven: Yale University Press. p. 208. ISBN 978-0300186611. ^ Wolfram, Stephen (2002). A New Kind of Science. Wolfram Media. p. 998. ISBN 978-1579550080. ^ Lorenz, Edward N. (June 1969). "The predictability of a flow which possesses many scales of motion". Tellus. XXI (3): 289–297. doi:10.1111/j.2153-3490.1969.tb00444.x. ^ Tim, Palmer (19 May 2017). "The Butterfly Effect - What Does It Really Signify?". Oxford U. Dept. of Mathematics Youtube Channel. Retrieved 13 February 2019. ^ Emanuel, Kerry (26 March 2018). "Edward N. Lorenz and the End of the Cartesian Universe". MIT Department of Earth, Atmospheric, and Planetary Sciences Youtube channel. Retrieved 13 February 2019. ^ "Chaos and Climate". RealClimate. Archived from the original on 2014-07-02. Retrieved 2014-06-08. ^ Heller, E. J.; Tomsovic, S. (July 1993). "Postmodern Quantum Mechanics". Physics Today. 46: 38. Bibcode:1993PhT....46g..38H. doi:10.1063/1.881358. ^ a b Rudnick, Ze'ev (January 2008). "What is...Quantum Chaos" (PDF). Notices of the American Mathematical Society. Archived (PDF) from the original on 2009-10-02. ^ Berry, Michael (1989). "Quantum chaology, not quantum chaos". Physica Scripta. 40 (3): 335–336. Bibcode:1989PhyS...40..335B. doi:10.1088/0031-8949/40/3/013. ^ Gutzwiller, Martin C. (1971). "Periodic Orbits and Classical Quantization Conditions". Journal of Mathematical Physics. 12 (3): 343. Bibcode:1971JMP....12..343G. doi:10.1063/1.1665596. ^ Gao, J. & Delos, J. B. (1992). "Closed-orbit theory of oscillations in atomic photoabsorption cross sections in a strong electric field. II. Derivation of formulas". Physical Review A. 46 (3): 1455–1467. Bibcode:1992PhRvA..46.1455G. doi:10.1103/PhysRevA.46.1455. ^ Karkuszewski, Zbyszek P.; Jarzynski, Christopher; Zurek, Wojciech H. (2002). "Quantum Chaotic Environments, the Butterfly Effect, and Decoherence". Physical Review Letters. 89 (17): 170405. arXiv:quant-ph/0111002. Bibcode:2002PhRvL..89q0405K. doi:10.1103/PhysRevLett.89.170405. PMID 12398653. ^ Poulin, David; Blume-Kohout, Robin; Laflamme, Raymond & Ollivier, Harold (2004). "Exponential Speedup with a Single Bit of Quantum Information: Measuring the Average Fidelity Decay". Physical Review Letters. 92 (17): 177906. arXiv:quant-ph/0310038. Bibcode:2004PhRvL..92q7906P. doi:10.1103/PhysRevLett.92.177906. PMID 15169196. ^ a b Poulin, David. "A Rough Guide to Quantum Chaos" (PDF). Archived from the original (PDF) on 2010-11-04. ^ Lee, Jae-Seung & Khitrin, A. K. (2004). "Quantum amplifier: Measurement with entangled spins". Journal of Chemical Physics. 121 (9): 3949. Bibcode:2004JChPh.121.3949L. doi:10.1063/1.1788661. ^ Dizikes, Petyer (8 June 2008). "The meaning of the butterfly". The Boston Globe. Archived from the original on 18 April 2016. Retrieved 8 June 2016. Weather and Chaos: The Work of Edward N. Lorenz. A short documentary that explains the "butterfly effect" in context of Lorenz's work.